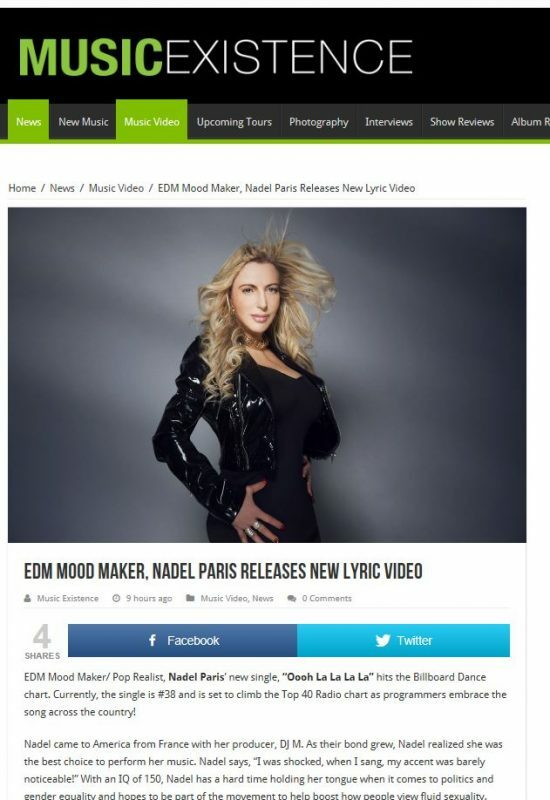 EDM Mood Maker/ Pop Realist, Nadel Paris’ new single, “Oooh La La La La” hits the Billboard Dance chart. Currently, the single is #38 and is set to climb the Top 40 Radio chart as programmers embrace the song across the country! A native-born Parisian, Nadel’s Mom was a Christian Dior model; that’s where she learned about the qualities of beauty, compassion and higher learning. At age 12, she had a contract with EMI France which helped jump start her love of music and acting. Nadel’s new single is gaining radio airplay across the country, widening Nadel’s audience reach with every spin! The debut video for her single, “Ooh La La La” will be available in March.